To investigate the results after photorefractive keratectomy (PRK) followed immediately by standard 30-minute corneal cross-linking (CXL) for keratoconus. This retrospective study included 26 eyes of 16 patients with keratoconus. Uncorrected distance visual acuity (UDVA), corrected distance visual acuity (CDVA), manifest refraction spherical equivalent (SE) and cylinder, apical keratometry, corneal higher order aberrations (HOAs), and corneal haze were evaluated. Mean follow-up was 32 ± 8 months (range: 19 to 50 months) and mean patient age was 31 ± 5 years (range: 24 to 40 years). Mean UDVA improved significantly from 0.80 ± 0.39 to 0.32 ± 0.36 logMAR after surgery (P < .001), but the mean CDVA worsened significantly from 0.07 ± 0.09 to 0.15 ± 0.14 logMAR after surgery (P = .006). Thirteen eyes (50%) lost at least one line of CDVA, 3 eyes (12%) lost two lines, and 4 eyes (15%) lost three lines. SE, cylinder, and apical keratometry decreased significantly. Corneal haze grade 1 was found in 15 eyes (57.7%), grade 2 in 6 eyes (23.1%), and grade 3 in 1 eye (3.8%). A significant correlation was seen between postoperative CDVA loss and corneal haze (P = .001) and history of atopy (P < .01), but not with corneal HOA change. Despite an improvement in UDVA and topographic values, the loss of CDVA, explained by postoperative haze, demonstrates that this procedure should be approached with caution, may not be as safe as initially thought, especially in patients with atopy and can cause severe visual acuity loss. Aiming at combining vision improvement, associated with a more regular corneal topographic pattern, with an effective treatment to halt ectasia progression, topography-guided PRK followed immediately by CXL has been reported with satisfactory results and minimal complications.5–13 The purpose of this study was to analyze the safety and complications after sequential PRK and standard 30-minute CXL in patients with keratoconus. This retrospective non-randomized interventional study comprised 26 eyes of 16 patients with keratoconus that had PRK followed immediately by CXL. The study included all patients who underwent this combined treatment at Sadalla Amin Ghanem Eye Hospital, Joinville, Brazil. Surgeries were performed by either one of two experienced surgeons (RCG and VCG) between November 2009 and March 2012. The study was approved by the institutional review board of Sadalla Amin Ghanem Eye Hospital and was conducted according to the tenets of the Declaration of Helsinki. All patients provided informed consent after receiving a detailed description of the treatment and its possible complications. 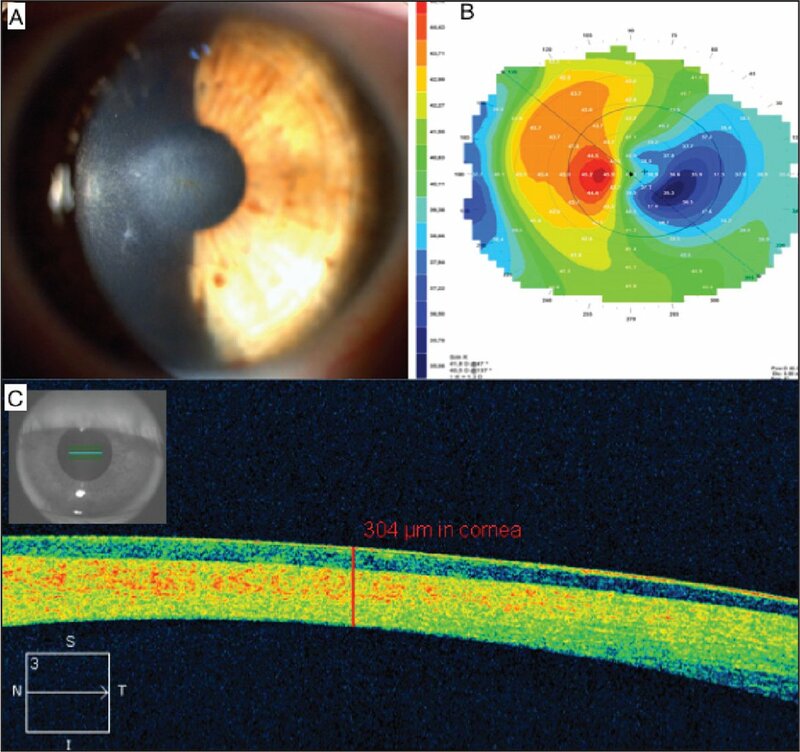 The inclusion criteria were: age of at least 21 years, a history of contact lens intolerance, axial topography pattern consistent with early or moderate keratoconus, a predicted residual stromal bed greater than 400 µm, and a desire to reduce dependence on glasses. Exclusion criteria were uncontrolled atopic conjunctivitis, a history of corneal surgery or delayed epithelial healing, and pregnancy or lactation during the study. All treatments were performed using the SCHWIND Amaris 500 excimer laser platform (SCHWIND eyetech-solutions, Kleinostheim, Germany), using either topography-guided ablation with the Keratron Scout topographer (Optikon, Rome, Italy) or aspheric ablation. Static and dynamic cyclotorsion and pupil offset were controlled. Under topical anesthesia, PRK was performed with an optical zone that varied from 5.5 to 6.5 mm. The epithelium was removed either mechanically with a spatula or by laser ablation (transepithelial mode). The value of the maximum ablation depth was determined based on targeting emmetropia, respecting a minimum residual calculated cornea thickness of 400 µm. After laser ablation, mitomycin C (MMC) 0.02% was applied for 20 to 30 seconds; the exposure time was set proportional to the depth of ablation. 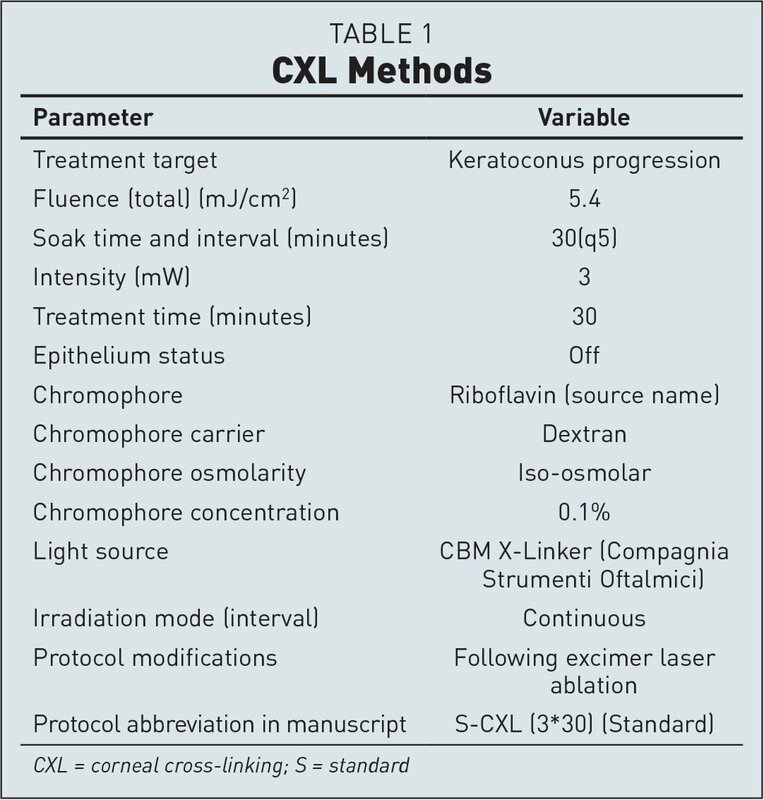 Standard CXL was immediately performed according to the original protocol published by Wollensak et al.2 A therapeutic contact lens was placed after the surgery for 7 days (Table 1). During the first week after surgery, gatifloxacin 0.3% and dexamethasone 0.1% eye drops were applied every 6 hours and ketorolac tromethamine 0.4% was applied every 12 hours. After contact lens removal, artificial tears and loteprednol etabonate 0.5% were used every 6 hours for 1 month. Postoperative evaluations were performed on the seventh day to evaluate epithelial healing and to remove contact lenses. All patients were instructed to use sunglasses for 12 months during all times when UV light was present. They were further advised to use a hat or cap when exposed to the sun. A complete evaluation was performed during the follow-up visits, including biomicroscopic haze evaluation, corneal topography (Medmont, Victoria, Australia), tomography (Orbscan; Bausch & Lomb, Rochester, NY, or Galilei, Ziemer, Port, Switzerland), and refraction. Study parameters included uncorrected distance visual acuity (UDVA), corrected distance visual acuity (CDVA), manifest refraction, flat and steep keratometry readings, and corneal higher order aberrations (HOAs) recorded from the topography data. Corneal haze was documented at each postoperative visit and graded on a scale from 0 to 4 (0: clear cornea; grade 1: mild haze; grade 2: moderate haze; grade 3: severe haze; and grade 4: corneal scar obscuring iris anatomy). Data were analyzed using Microsoft Excel 2007 software (Microsoft Corporation, Redmond, WA) and SPSS 13.0 software (SPSS, Inc., Chicago, IL). The normality of all data samples was evaluated with the Shapiro–Wilk test. The Wilcoxon or Mann–Whitney U test was used for variables without a normal distribution. Visual acuity values were converted to logMAR notation for averaging and comparison. A P value of less than .05 was considered statistically significant. Continuous data were expressed as mean values ± standard deviation and range. This study included 26 eyes from 16 patients (8 men and 8 women), with a mean age of 31 ± 5 years (range: 24 to 40 years), a mean follow-up of 32 ± 8 months (range: 19 to 50 months), and a mean central corneal thickness of 552 ± 17 µm (range: 460 to 578 µm). Seven patients had a history of atopy. Mean central stromal ablation depth was 44.6 ± 20.9 µm (range: 7.8 to 96.2 µm) and mean optical zone was 6.28 ± 0.26 mm (range: 5.50 to 6.50 mm). The mean attempted spherical correction was −1.37 ± 1.93 diopters (D) (range: −5.75 to +1.50 D) and the attempted cylindrical correction was −1.30 ± 0.82 D (range: −3.00 to 0.00 D). Ten patients underwent bilateral procedures. No intraoperative complications occurred. At 1 week postoperatively, 24 eyes had complete epithelial healing. Two eyes of one patient had delayed healing up to 14 days. At day 42 after surgery, another patient had central nodular epithelial hyperplasia in both eyes and epithelial erosion in the left eye (Figure 1). The onset of the deeper haze related to loss of CDVA was observed from the third postoperative month. This type of haze was intense and preendothelial, typically seen after CXL, and pathophysiologically different from subepithelial haze observed after the PRK procedure, which has a good response to prolonged use of steroid drops. Due to the characteristics of this haze, steroids were not prescribed for a longer time than the postoperative routine. Central nodular epithelial hyperplasia and inferior paracentral epithelial defect 42 days after combined photorefractive keratectomy and corneal cross-linking. Table 2 shows postoperative visual and refractive results. After the treatment, the mean UDVA and manifest refraction improved significantly compared with baseline measurements, whereas CDVA decreased significantly. At the last follow-up, 11 eyes (42%) maintained CDVA. However, 13 eyes (50%) lost at least one line and 7 eyes (27%) lost two or more lines (Figure 2). No statistically significant differences were observed in the change of CDVA among the different treatment strategies (topography-guided and aspheric PRK) (P = .573; independent-samples Mann–Whitney U test). Patients with a history of atopy had a significantly greater CDVA loss (mean loss of 0.24 logMAR lines) than those without (mean loss of 0.08 logMAR lines) (P < .01; independent-samples Mann–Whitney U test). 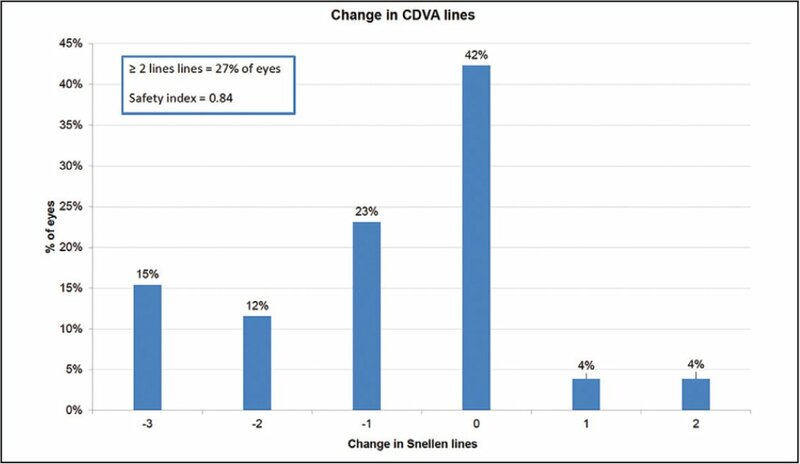 Change in corrected distance visual acuity (CDVA) lines after surgery at the last follow-up. A statistically significant corneal flattening was observed after surgery, with a decrease in mean and apical keratometry values (Table 2). Topographical astigmatism did not show a significant change. Analyses of the corneal HOAs after the procedure revealed that a significant reduction occurred for astigmatism (P = .039), coma (P = .023), and spherical aberration (P = .003) compared with the preoperative values (Table 3). No correlation was found between the changes in individual corneal aberrations and CDVA loss. Haze grade 1 was observed in 15 eyes (57.7%), grade 2 in 6 eyes (23.1%), and grade 3 in 1 eye (3.8%). No haze was found in 4 eyes (15.4%). There was a significant correlation between postoperative corneal haze and CDVA loss (correlation coefficient = 0.604; P = .001; Spearman's correlation). The appearance of clinically significant haze related to loss of CDVA was seen at 3 months postoperatively in 2 eyes (same patient), 6 months postoperatively in 4 eyes (2 patients), and 1 year postoperatively in 7 eyes (5 patients) (Table 4). Haze was intrastromal in all eyes astypically seen after CXL.14 In some cases, however, haze was intense and pre-endothelial, as previously reported.12 Subepithelial haze, as seen after PRK, was not observed in any case. The eye classified as haze grade 3 had a persistent deep corneal scar with severe irregular astigmatism on topography (Figure 3). A loss of three lines of CDVA occurred, and the patient underwent deep anterior lamellar keratoplasty. No correlation was found between the changes in individual corneal aberrations and haze. Also, no statistically significant differences were observed in haze incidence among the different treatment strategies (P = .882). (A) Central haze grade 3 after combined photorefractive keratectomy and corneal cross-linking. (B) Corneal topography showing severe irregular astigmatism. (C) Full-thickness stromal haze and thinning at the central cornea seen on optical coherence tomography. 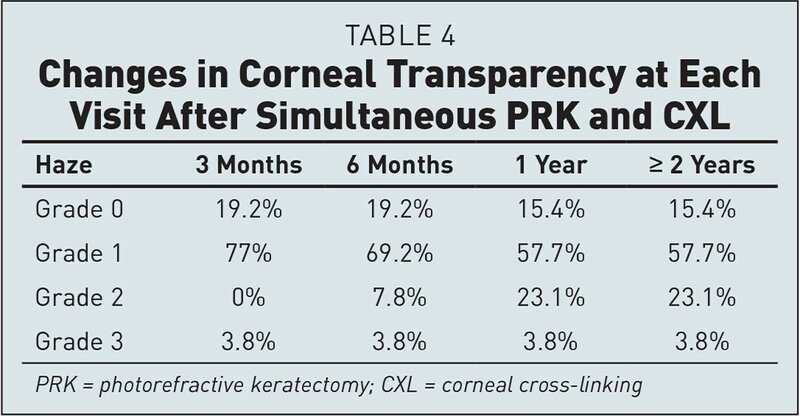 The results of our study reveal that PRK immediately followed by corneal CXL may not be as safe as previously described because the patients had a high incidence of corneal haze and surface irregularity and loss of visual acuity. The primary explanation for our findings most likely lies within the fact that myofibroblasts could be generated after atypical wound healing, associated with the interaction of two complex procedures, and result in more severe and persistent haze. We hypothesize that the stromal surface irregularity after an asymmetric ablation pattern, which is commonly associated with topography-guided PRK in keratoconic corneas, results in a defective basement membrane regeneration.15,16 This would lead to an increased epithelium-derived transforming growth factor signaling to the stroma, increasing myofibroblast generation, and subsequently developing haze. Typically, minimal myofibroblast generation could be detected after isolated ultraviolet-A (UV-A) and riboflavin CXL, indicating that the mild stromal haze associated with this procedure is related to transient corneal fibroblast production rather than more persistent haze due to the generation of myofibroblasts.15–17 Changes in transparency could also be partially explained by disorganized, more compacted collagen fiber layers seen on OCT. Contrary to our findings, Kanellopoulos5 published a study including 127 eyes that underwent CXL and PRK in a combined procedure on the same day (Athens Protocol). Their patients showed an improvement of CDVA from 0.39 ± 0.3 to 0.11 ± 0.16 logMAR, and no eye lost lines of UDVA or CDVA over a mean follow-up of 36 ± 18 months. No complications were reported, and the mean haze score was only 0.5 ± 0.3. Unlike our study, they used 20% alcohol solution within a 9-mm titanium laser epithelial keratomileusis trephine for 20 seconds before the laser treatment, after which the epithelium was wiped with 10 mL of chilled balanced salt solution. Another difference was in relation to postoperative assessment; prednisolone acetate 1% was used four times a day for 60 days. Kymionis et al.7 investigated 28 eyes that underwent CXL and PRK on the same day and described a posterior linear stromal haze corresponding to the centrally treated area of the cornea by slit-lamp examination at the first postoperative month in 13 of 28 eyes (46.42%). At 12 months after surgery, despite its anterior movement and decreased density, posterior haze did not completely disappear at the slit lamp. CDVA was not influenced by this finding. In 2011, the same authors published another study8 with 31 eyes (26 patients) that underwent topography-guided PRK immediately followed by CXL where the mean follow-up was 19.53 ± 3.97 months. At the last follow-up examination, UDVA and CDVA decreased significantly and 3 of 31 eyes (10%) lost one line of CDVA. Kontadakis et al.19 demonstrated that both CDVA and UDVA showed a more striking improvement in the combined treatment group in comparison with the CXL group after a long follow-up (mean: 39 months). No patient lost more than two lines of Snellen visual acuity. By quantitative evaluation of confocal microscopy results, they found a significantly deeper effect of the CXL treatment in the eyes treated with the combined procedure in comparison with those treated with CXL alone. They concluded that these different results are attributed to a more potent effect of CXL after the Bowman layer was ablated. Two recent reports described a late deep stromal haze despite an uneventful postoperative course. Güell et al.12 reported a deep stromal scar in a 22-year-old patient with forme fruste keratoconus who underwent combined PRK and CXL. UDVA of 20/20 was obtained in both eyes. However, a deeper stromal haze was observed in the right eye, which affected visual quality. Prakash et al.13 demonstrated a similar complication in a 44-year-old man after combined PRK and CXL. 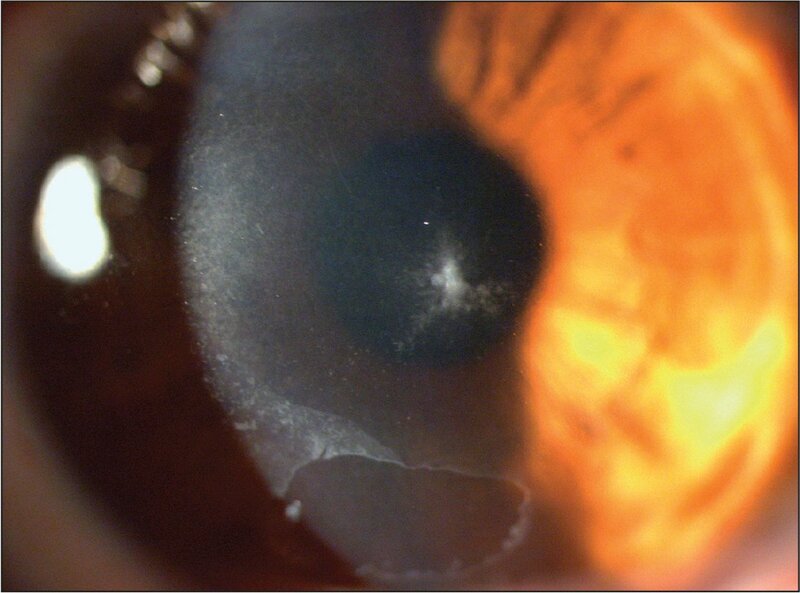 A deep scar involving the anterior half of the cornea was observed in both eyes with loss of CDVA in one eye. Alessio et al.20 analyzed corneal confocal microscopy changes after combined PRK and CXL. They demonstrated a significant decrease in keratocyte density in the anterior mid-stroma even 4 years after treatment. A complete depletion was observed in more than 50% of the patients. They raised the hypothesis that the removal of the Bowman membrane after photoablation could cause a deeper penetration of riboflavin into the stroma, leading to a more intense CXL treatment and explaining the remarkable loss of keratocytes postoperatively. The hypothesis that the absence of Bowman's layer could be a factor facilitating higher UV-A absorption from the corneal stroma (leading to a more intense CXL treatment) was not supported by the study of Kolozsvári et al.,21 which showed the UV-A ray absorption coefficient is similar to all corneal layers. When CXL was associated with PRK, the findings of our study revealed that, despite an improvement in UDVA, manifest refraction, and topographic values, a substantial loss of CDVA was observed, associated with an increased incidence of corneal haze and surface irregularity. These results show that the procedure should be approached with caution, may be not as safe as originally thought, and can cause severe visual acuity loss. Some changes in the treatment protocol of CXL, such as shortening the UV exposure time, where fast CXL was used instead of traditional CXL, were already observed in some studies with good results and no haze and loss of CDVA.25,26 Further studies must take place with a greater number of patients and longer follow-up to evaluate safety, efficacy, and predictability of combined PRK and CXL. Kolozsvári L, Nógrádi A, Hopp B, Bor Z. UV absorbance of the human cornea in the 240- to 400-nm range. Invest Ophthalmol Vis Sci. 2002;43:2165–2168. Al-Amri AM. 5-year follow-up of combined non-topography guided photorefractive keratectomy and corneal collagen cross linking for keratoconus. Int J Ophthalmol. 2018;11:48–52. From Federal University of Rio de Janeiro, Rio de Janeiro, Brazil (MRS); University of São Paulo, São Paulo, Brazil (MRS); and Sadalla Amim Ghanem Eye Hospital, Joinville, Brazil (RLBM, RCG, VCG). Dr. Santhiago is a consultant for Alcon and Ziemer. The remaining authors have no financial or proprietary interest in the materials presented herein.